Native Americans depended on the forest ecosystem for much of their food. They hunted the animals and gathered the plants. Aboriginal people hunted white-tailed deer and raccoon, squirrels, turkey, bobwhite (quail), and elk, as well as a variety of other animals. It is important to recognize that not all of the animals were found exclusively within the forests. The prairie-forest borders of savannas and barrens were critical habitat for many of these animals. These habitats were more open than the closed canopy forest. Deer browsed at the edges of forests during the warm months and moved to the more sheltered forest valleys and bottoms during the winter. Elk preferred the open mixture of grassland and woodland along forest edges. Bottomland forests were also important, especially in the central portion of the state, which was largely prairie. One of the few places that forest occurred within the Grand Prairie in central Illinois was along rivers and streams. These streams supported muskrat, beaver, waterfowl, turtles, freshwater mussels, and fish, all of which were important parts of the Native American diets. The forest provided a diversity of plant foods as well as game. Native Americans gathered plant foods from the forests and later grew their own crops, largely in the bottomlands along rivers. Nuts were an especially important forest food source in Illinois for thousands of years. Native Americans consumed acorns, walnuts, hickory nuts, and pecans. They were nutritious, easy to collect and process, and were stored for eating during the winter months. 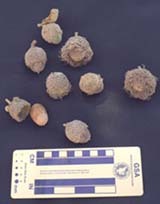 Acorns and nuts were also readily available because oakhickory forests were widely distributed throughout the state. Savannas and other open-canopied woodlands were some of the best locations for acorns, as oak and hickory trees in open areas have higher nut productivity. Hazelnut collection often took place at the forest edges, as well. Nuts were generally considered a good food resource, but their local availability varied. Some oaks, for example, produced acorns only every other year. Production varied from bountiful (such as when there was adequate rainfall) to less productive other years. There was also competition for nuts and acorns from squirrels, deer, rodents, birds, and insects. Other important plant foods included tubers, seeds, fruits, and the sap from sugar maple trees. Many Native American groups pounded the cambium of sugar maple trees to make "bark" bread. The Iroquois people of Illinois consumed tubers (underground stems) of pepperroot (Dentaria laciniata) that grew in rich woods. The Menominee people of Illinois ate Indian turnip or 'jack-in-the-pulpit' (Arisaema triphyllum)which grew in forested uplands and savanna. A variety of groups either boiled the tubers of groundnut (Apios americana) and underground fruits of hog peanut (Amphicarpa bracteata) or ate them raw. These legumes grew in open woods and upland forests. Native Americans ate and cultivated a variety of seeds. Many of these plants, such as goosefoot and marsh elder grew in bottomlands (floodplains, disturbed areas). Fruits were also an important component of the diet, and were often dried. These included persimmon, blackberries and raspberries, gooseberries and currants, may apple, blueberries, and grapes, all of which prefer forest edges or open woods. They also consumed plums, crabapples, black cherries, rose hips, pawpaw, and other fruits that grew within forests. To learn more about Native American foods, see the Historic Native American module sections on Hunting & Fishing and Gathering. See the Native American Activity Recipes (html).